We provide Cup Down Rolling Mill for Cutlery in its prime form which are used to reduce the thickness of the cupping/ from portion of spoon/knife which reduces the weight of the front portion and hence balances the piece. Previously the rolling was done on the edge of the roll through a gap in the window, but here we apply advanced technology that makes mills able to roll down through heavy SS202 grade also. 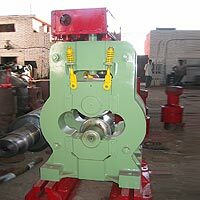 Our cup down rolling mill for cutlery are formed of En-31 forged alloy steel for cold rolling and hot die steel for hot rolling.